Having never been to Azerbaijan I will defer to Lonely Planet’s description of the country: “Selling itself as the ‘Land of Fire’, Azerbaijan is a tangle of contradictions and contrasts. Neither Europe nor Asia, it’s a nexus of ancient historical empires, but also a ‘new’ nation rapidly transforming itself with a super-charged gust of petro-spending. The cosmopolitan capital, Baku, rings a Unesco-listed ancient core with dazzling 21st-century architecture and sits on the oil-rich Caspian Sea. In the surrounding semi-desert are mud volcanoes and curious fire phenomena. 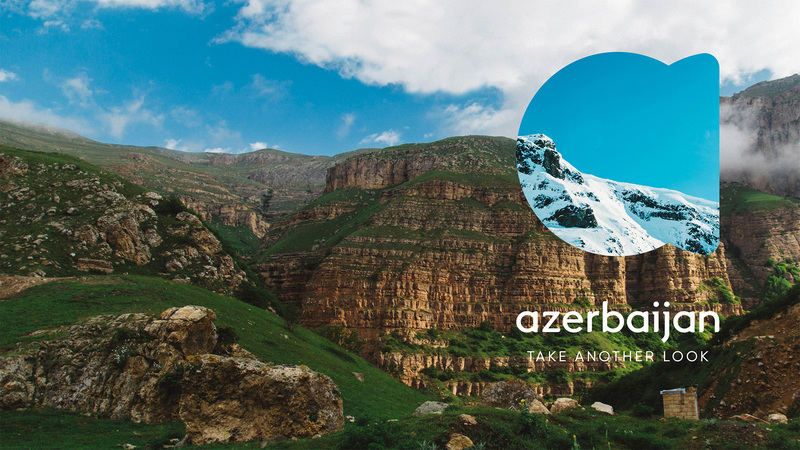 Yet barely three hours’ drive away, timeless rural villages, clad in lush orchards and backed by the soaring Great Caucasus mountains are a dramatic contrast.” This past October, the Azerbaijan Tourism Board introduced a new identity designed by Landor. We immersed ourselves in the history, the landscape, the culture, and the people. Everyday a new contradiction stopped us in our tracks and we realized this was a place we would have to look at differently. We needed to open people’s eyes to this land of revelations, where every corner hides a fresh discovery. 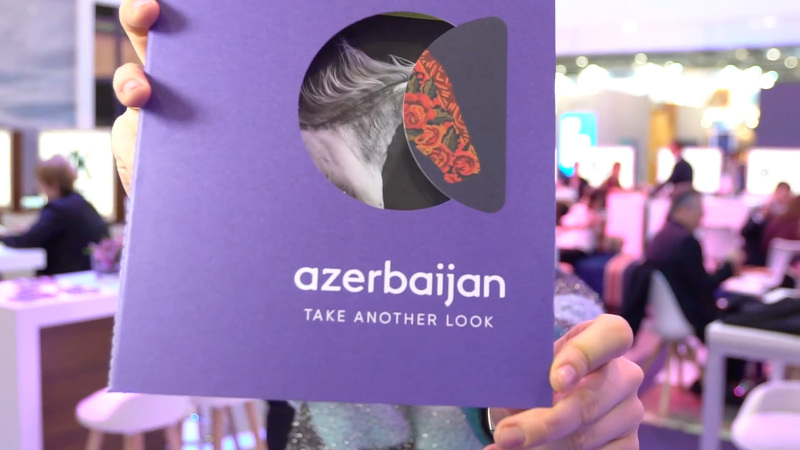 Our discovery led us to the brand idea “Take another look” and to our visual identity, which is an invitation to consider Azerbaijan from a new point of view. 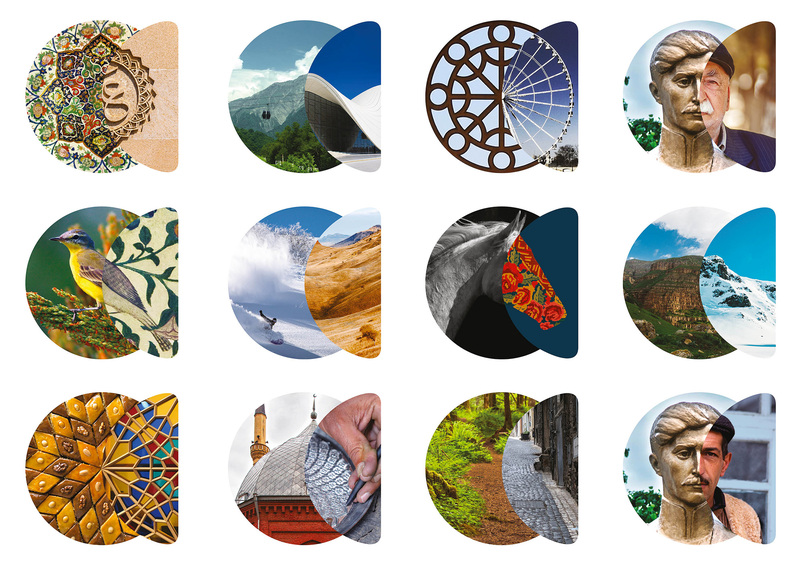 The “reveal lens” enables two contrasting views of the country to come together to expose an intriguing new perspective on the place and its culture. The old logo, well, nothing says “Welcome tourists!” like a flaring oil stack. It’s probably not fair to poke too much fun at what was clearly a logo with good intentions but lacking the necessary resources to make it appropriate or good so I will only mention one more snarky thing: someone forgot to tell the “I” in the wordmark it was casual Friday. The new logo, at first, seems kind of random when seeing the abstract “a” monogram as the color variation in the two elements makes it look like a circle with a slice of fruit on top of it. The connection of the monogram to the first letter of the wordmark isn’t immediate but it’s also not far-fetched and once you see the relationship it starts to make more sense. The two elements of the monogram serve as individual windows through which contrasting images can be seen and this activates the icon in a much more interesting and successful way than when it’s only in contrasting colors as there is a better synergy between the two elements as they work together to reveal structurally-similar images. The wordmark is, in principle, a geometric sans with customized curved corners that are usually annoying but there is something more pleasing than usual about the approach in this case that makes the final typography look more intentional and better resolved. They should have stopped before adding the downward serif on the “z” though. The monogram works even better when used as a single shape like in the ads above in the logo-as-window treatment; its large square footage works very well in really letting another image seep through it and make a contrasting statement. I also like the combination of bold sans serif and light Italic serif in the copywriting — it’s Design 101 but it’s nicely executed. Brochure spotted in this video. Nice die-cut. Not much in terms of applications but there is clearly plenty of good things to work with and that brief glimpse at the printed brochure shows the potential of the monogram to have great impact in the printed world. 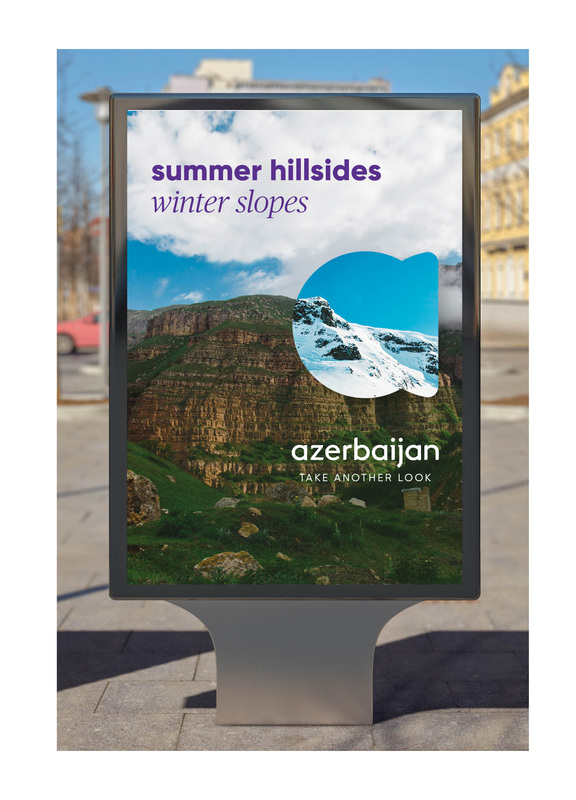 Overall, I think this does a great job in feeling contemporary while providing a historical sense of the rich textures of the country — whether it be their crafts or landscapes — and it manages to feel like a solution unique and appropriate to Azerbaijan. Thanks to Ivan Filipov for the tip. Having never been to Azerbaijan I will defer to Lonely Planet's description of the country: \"Selling itself as the 'Land of Fire', Azerbaijan is a tangle of contradictions and contrasts. Neither Europe nor Asia, it's a nexus of ancient historical empires, but also a 'new' nation rapidly transforming itself with a super-charged gust of petro-spending. The cosmopolitan capital, Baku, rings a Unesco-listed ancient core with dazzling 21st-century architecture and sits on the oil-rich Caspian Sea. In the surrounding semi-desert are mud volcanoes and curious fire phenomena. 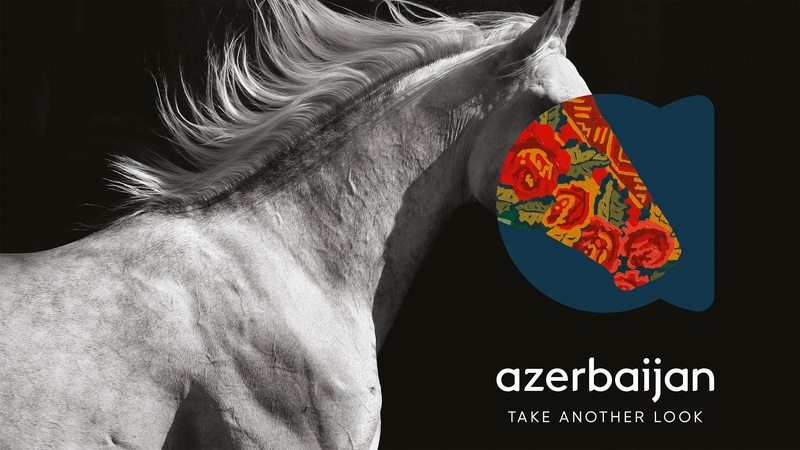 Yet barely three hours' drive away, timeless rural villages, clad in lush orchards and backed by the soaring Great Caucasus mountains are a dramatic contrast.\" This past October, the Azerbaijan Tourism Board introduced a new identity designed by Landor.